School administrators in a town outside Minneapolis are condemning as "anti-Semitic" and "outrageous" in a social media post showing two students giving Nazi salute in front of a poster that appears to make light of Hitler and Nazis. 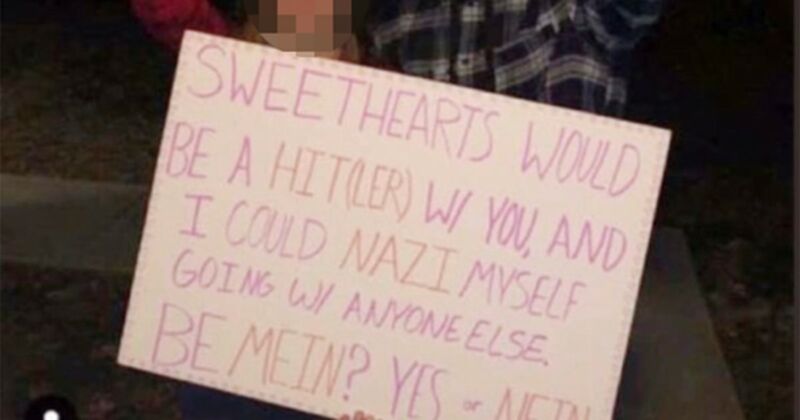 The two students from Minnetonka High School are pictured giving Nazi salute while in front of an invitation to a dance that reads: "Sweethearts would be a Hit (er) w / you, and I could Nazi myself going to w / anyone else. Be Mein? Yes or Nein ?. " According to Minnetonka Schools Superintendent Dennis Peterson, both of them posted the picture featuring the Nazi salute on social media and it was widely reposted on Facebook. After the picture came to the attention of the school administrators, the students deleted it, the superintendent said. He called it "an outrageous act by two of our students." "This kind of image causes great sadness and bread," Peterson said in a letter to district families. "I condemn what was done." School officials did not release names of the students and said they could not divulge details of possible disciplinary actions due to privacy concerns. The senior high school, Jeff Erickson, wrote in a statement to the school community that the "anti-semitic media post … in no way aligns with our school's core values." The Jewish Community Relations Council of Minnesota and the Dakotas released a statement saying they are "deeply disturbed by the egregious anti-Semitic image circulating on social media." "We are gravely concerned about the lack of Holocaust knowledge among American millennials," the council said in its statement, citing a 2018 study released by the Claims Conference that said 66 percent of millennials in the U.S. did not know what Auschwitz was. Peterson said in his statement that the District's teaches about the Holocaust, "it has apparently not been enough." "We, have a community, must do an even better job of educating students about Hitler and the Holocaust," he wrote. The post by the Minnesota teens comes only two months after a group of students in Wisconsin appeared to give a Nazi salute in a viral prom photo.